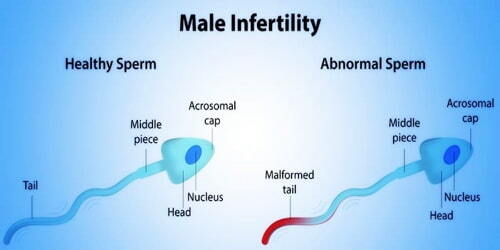 Definition: Male infertility refers to a male’s inability to cause pregnancy in a fertile female. In humans, it accounts for 40–50% of infertility. Male infertility is due to low sperm production, abnormal sperm function or blockages that prevent the delivery of sperm. Illnesses, injuries, chronic health problems, lifestyle choices, and other factors can play a role in causing male infertility. A man’s fertility generally relies on the quantity and quality of his sperm. If the number of sperm a man ejaculates is low or if the sperm is of a poor quality, it will be difficult, and sometimes impossible, for him to cause a pregnancy. 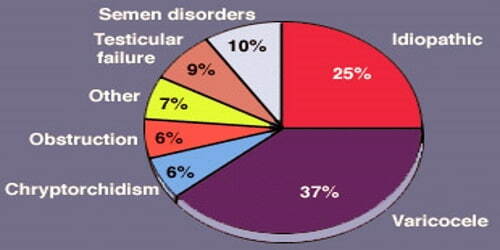 It affects approximately 7% of all men. 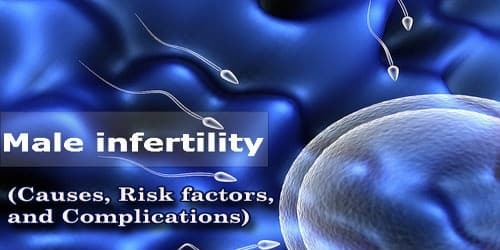 Causes and Risk factors of Male Infertility: In at least half of male infertility cases, doctors cannot identify an exact cause. For the remaining cases, infertility is either due to environmental, genetic or other identifiable factors. About two-thirds of infertile men have a problem with making sperm in the testes. Either low numbers of sperm are made and/or the sperm that is made does not work properly. Male infertility is more common in environments with high levels of environmental pollution, including water contaminants, pesticides, and herbicides. Some recent population studies have shown that sperm counts have been declining universally even though infertility has not been increasing substantially.